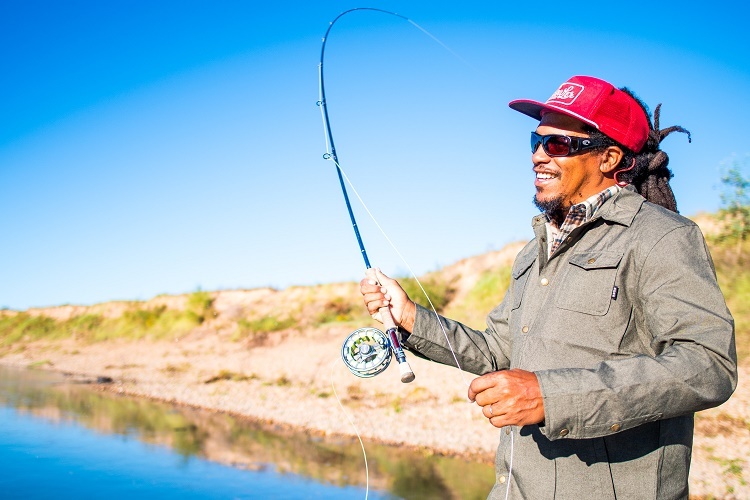 Few people think of Texas when the topic of fly-fishing comes up, unless you’re Alvin Dedeaux, that is. Well, we’ve got some great fly-fishing opportunities here. Alvin is a sought-after Texas fly-fishing guide. He’s partnered with Texas Parks and Wildlife Foundation, the nonprofit arm of Texas Parks and Wildlife Department to help recruit new members. Anyone who goes to WeWillNotBeTamed.org and becomes a new foundation member by April 12 will be entered in a drawing to win a half-day fly-fishing trip with Alvin. I guided for trout all over the Western US, and I think what we have here in Central Texas rivals a lot of that stuff. Especially the rivers. Because, as a lot of people know, our rivers are kind of an underutilized resource. We’ve got tons of really beautiful small streams with very little pressure and really aggressive, hungry fish. And I think it rivals anything anywhere—you know, it’s just different. On top of that, we have the Texas coast. And the inshore fisheries on the Texas coast are world-class for like casting for redfish and speckled trout. So Texas is really, I think, an undiscovered central Mecca for fly-fishermen. Learn more about the work of the Texas Parks and Wildlife Foundation and how to become a member, and entered into a drawing for a half day fly fishing trip with Alvin Dedeaux at WeWillNotBeTamed.org. You are currently browsing the Passport to Texas weblog archives for the day Thursday, April 4th, 2019.